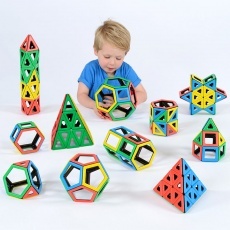 A great innovation from the makers of Polydron that will allow children to explore the worlds of shape and space and magnetism all in one exercise. 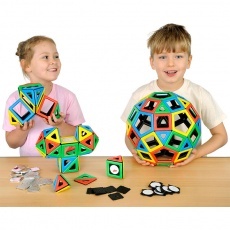 Magnetic Polydron combines the fun of construction with the lessons of polarity. The product is coloured black on one side with the primary colours of red, yellow, green and blue on the reverse. The pieces will join when the polarity is correct in line with the colours. 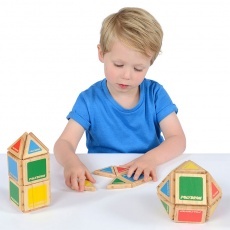 Children will play for hours, experimenting with different shapes, building various models and constructions. 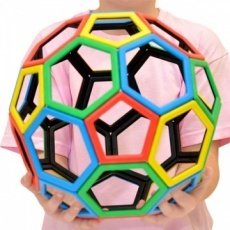 Manufactured from hard wearing ABS plastic, Magnetic Polydron is timeless and will be used by generations of children - it is an excellent value for money product, as well as being a fun, informative and highly addictive addition to the classroom!